Never liked the Windows 8 tiled menu? You are not the only one, I myself had upgraded to Win 8 from 7, but after a while got tired of looking at the tiles, searching for my Apps and then reverted back to Win 7. Having a smart phone like interface for Windows 8 may have its admirers, but it did not have the numbers Microsoft would have liked. So what does Microsoft do? The answer is simple, go for the middle path. And that is what Microsoft has done with Windows 8.1. Microsoft will publicly show off the improvements it has made to Windows 8.1’s Modern UI sometime tomorrow. Its been 7 months since the launch of Windows 8 and bowing to the popular opinion Microsoft has made many changes in the Windows 8.1. It will be available free to the Windows 8 users through the Windows Store. Touch was the essence on which Windows 8 was built and 8.1 will continue the legacy. Some of the changes that have been incorporated in Windows 8.1 are given below. This is one issue which formed the crux of many threads in various fora. It has had its critics and likes but not having the control panel easily accessible is the biggest drawback of Windows 8. Microsoft seemed to have realised that! But it is only visible in a tiny line buried at the end of the Microsoft blog. In Win 8.1, you’ll now be able to choose from different views to boot into and select your own options. Its a change but only just. Microsoft also says the “hint” icon displayed when hitting the lower-left corner of the screen has now been changed so that a Windows logo appears, and it will always be visible in the Desktop mode. So this somewhat evokes the old Start button, but doesn’t quite reinstate it. The Start screen will now consist only of tiles that you want to pin there. The earlier "All apps" view was much better organised but also difficult to find. This view now pops up with a swipe upwards from the bottom of the screen that is if you aren't using it by default from boot menu. Another thing Microsoft has done is that the newly installed Apps tiles will be highlighted similar to what we have in Windows 7. So ultimately the start screen will show only the tiles you want to see. 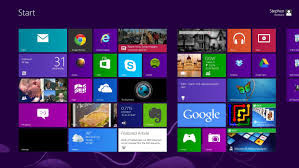 With the tiling system, the tiles in Windows 8 were prone to be accidentally moved or displaced. With Win 8.1, that has been solved to a extent because in Win 8.1 you will need to tap the tile and hold or right-click to move them around. Win 8 also offers a wider range of tile sizes to choose from. The new small and large squares make the Start screen look very similar to Windows Phone 8’s main menu. Multiple selection of tiles was a much needed relief, for you can now resize, move and even get rid of several tiles in one go. However there is no information in the blog whether all tile animations can be turned off in one shot. There are also more choices for the Start screen’s background. There are more colours and new “tattoo” patterns (including animated ones), but users will most likely appreciate the ability to use any customised image as the background and also have a single image as desktop wallpaper and Start screen background. As I had noted above Windows 8 made a simple task of getting into the system a presumably difficult one for users because Control Panel was not easily accessible to users. With Windows 8.1, Microsoft says that would not be much of a problem right now. Though explicit shortcut to Control Panel has not been provided, but Microsoft indicates that there should be nothing in the Control Panel that cannot also be found outside the desktop, including hardware setup, power management and domain management. You can now run a Slideshow as a screensaver when your device is lock. The slides can contain anything you have stored on the hard disk or in you cloud accounts. Windows 8.1 also gives you ability to take photos from the webcam even when the device is locked. The Snap feature in Win 8.1, is now not limited to specific screen sizes. You can snap two apps next to each other and drag the bar between them arbitrarily. You can also have two instances of the same app snapped next to each other on screen, such as two document windows. PC users with more than one monitor will be able to snap even more apps together on screen, run different full-screen apps on different monitors and even leave the Start screen permanently visible on any one monitor. Free apps will be easier to find and the homepage will have pinned lists of top picks and new entries. Related apps are now listed in an app’s detailed view, along with more descriptive information about it. Apps can update themselves in the background instead of requiring a user to check for updates. Internet Explorer has been further updated to version 11. Microsoft assures that touch response is improved, pages will load faster, there’s no limit on open tabs and you can choose to have the address bar visible at all times. Searching for anything from the Start screen or within the Modern UI will now bring up a Bing results page with results from the Web, your synced SkyDrive and social accounts, and apps. Results will come with “Quick Actions” shortcuts for doing things such as playing media files. The new search experience is described as “the modern version of the command line!” by Microsoft. Microsoft has said that the preview will be launched on June 26, coinciding with the Microsoft DEVCON and you may get your hands on the new build soon after that.